So this is a huge FREE expert tip for everyone running Facebook ads trying to find the holy grail of audiences. Feel free to buy me a beer after reading this. Ads that get the best Engagement/ROI and that are the cheapest to put in front of a targeted audience are the ones that generate a lot of social proof (likes, comments, and shares). When you have an ad that accumulates lots of social proof (which facebook loves), it instantly fosters trust and credibility with your product. Let’s not forget the more likes, comments, and shares your ad gets also give you a higher relevance score which translates to lower ad costs for you! 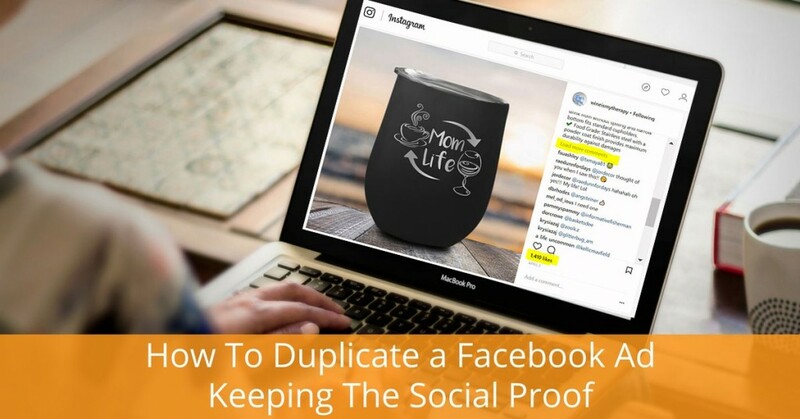 The problem marketers have is when you want to create a new ad, to test different targeting, you lose all of that social proof when duplicating an ad. In this expert tip, I will show you how to test different audiences with the same social proof and actually ends up skyrocketing likes, comments and shares for all the ads. First, let’s quickly talk about the way not to do it, this is the way most will duplicate an ad or ad set. Let’s say I have the following ad which has a lot of social proof tied to it and I want to duplicate the ad set to target a different audience. 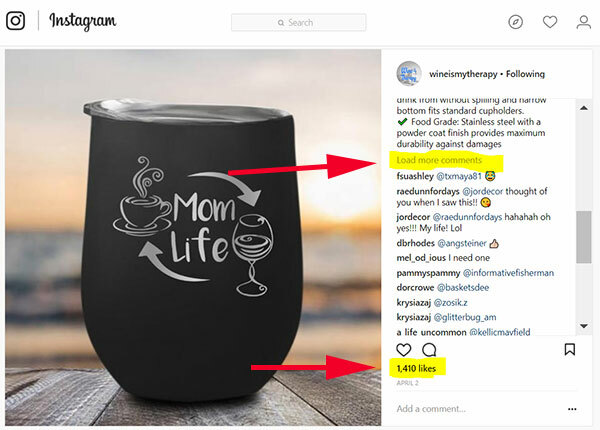 In this example I am targeting Instagram audiences but works the same on facebook. Normally, you would select the ad set and click the Duplicate button. The problem doing it this way is that doing it this way will create an entirely new ad with no social proof. Don’t we want to leverage the social proof that you already paid for? The key is that we need to find the post id of the ad that has the most social proof. 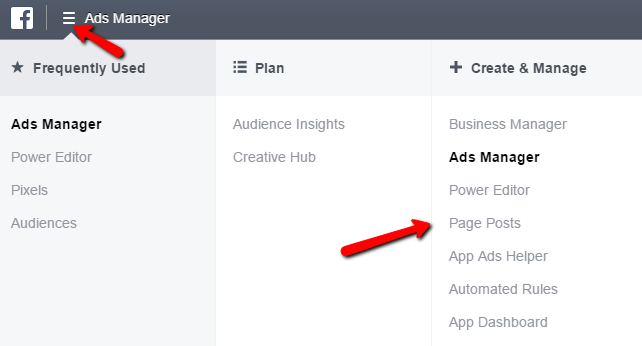 Once you are in your Ads Manager, choose Page Posts under the Create & Manage section. One the Next screen, select Ad Posts and you will see all your ad posts. Find the one you are looking for and copy the ID. Now you can create a new ad set and then create a new ad within that ad set. 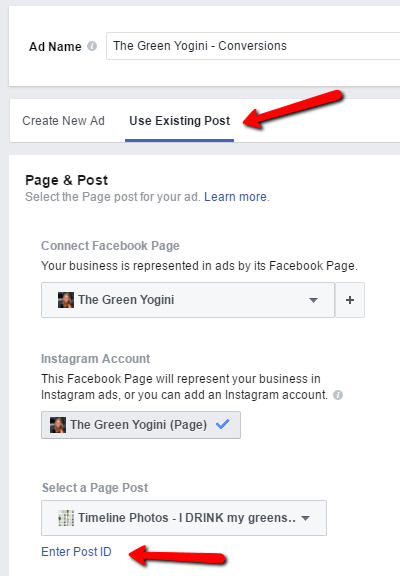 When creating that new ad, instead of using the creating a new ad option, select “Use Existing Post”, click the Enter Post ID link. Finally paste your post ID and click submit. In the ad preview area, you will see your original ad post. So that is how you can copy an existing ad and keep the social roof. But what if you are starting a brand new campaign and you want to use the same ad for multiple ad sets so that one ad accumulates all the social proof. Here is how to set that up. First create the campaign, one ad set and ad. Finish the setup by actually publishing your ad. Once you publish your ad, your ad will get a post id. Now, you can find the post id (as described above) and create the remainder of your ads using that post id. This way you will end up with many different ad sets but they will all be using the same ad. So as your ad gets likes, comments and shares, it will be reflected in all your ads. Comment below, I would love to hear how you intend to use this strategy when creating new ad campaigns. If you change copy or lets say value offer, will post still retain all social proof? Essentially can you continue to a/b test different cohorts while building social proof on ad? Question… Can I use a post ID from an ad that had good engagement but is no longer active? Awesome tip guys! Been looking for the solution to this for a while. Just gutted I didn’t find it sooner.